Originally published in the National Genealogical Society Quarterly 98, no. 2 (June 2010). By Paul K. Graham. Proving familial relationships among Georgia’s Blue Ridge pioneers can be daunting. The mountain range, terminating at the Appalachians’ southern end, is known for weathered peaks often draped in blue haze. Largely unsettled by whites before 1820, the territory was opened by land lottery.1 Discovery of gold in 1829 brought diverse treasure-seekers who mixed with spirited pioneer residents.2 Against this historical backdrop, a Barker family moved from South Carolina into Jackson County, Georgia, before 1810. In the 1820s and 1830s the family spread into newly formed Habersham, Hall, and Lumpkin counties, just east of the Chestatee River. From 1819 to his death in 1879 Alsaph B. Barker left a trail of documents through northeast Georgia counties. No known record states his relationship to anyone in a prior generation, but Alsaph’s connections to one northeast Georgia Barker family belie his genealogical anonymity. Evidence shows, indirectly, he was the eldest child of Isham Barker who settled in Jackson County and left his last known record in Lumpkin County. No known source, however, identifies Isham’s children directly. Alsaph was born about 1800 in South Carolina.3 Living in Jackson County, Georgia, he first appears on the public record as a winner in Georgia’s 1820 land lottery.4 He later moved thirty miles north to Habersham County, which opened for settlement through the same lottery. On 28 September 1826 A. 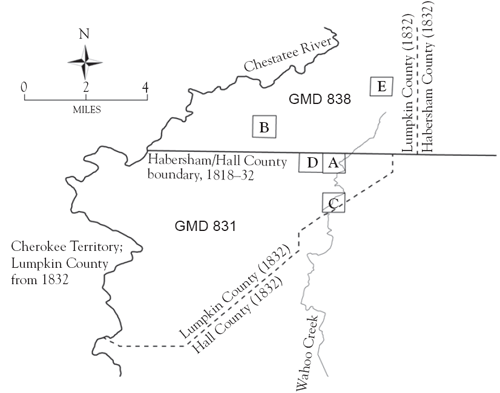 B. Barker married “Siner Moore”—Elizabeth Messina Moore—in Habersham County, where he lived in 1830.5 In 1832, when Habersham’s western end was added to Lumpkin County, Alsaph became a resident of the new county.6 See figure 1. Throughout his adult life Alsaph was in contact with children of Lewis Barker Sr., making Lewis a prime candidate for Alsaph’s grandfather. After two major land scandals in the 1790s Georgia began distributing new public lands by lottery.15 The state held eight land lotteries from 1805 to 1833.16 The legislature authorized the 1820 lottery on 15 December 1818.17 Single males from age eighteen could register one draw; Alsaph was about nineteen during the registration period.18 “Asaph B. Barker” registered and won 250 acres in southwest Georgia.19 Lewis Barker Jr. won land in the same lottery.20 Both men registered in Dickson’s Battalion District in Jackson County. On 10 January 1826 Isham Barker and A. B. Barker witnessed the sale of land in Habersham County from David Allison to Hubbard Barker. Four years later Isham attested to his presence at the transaction.21 More closely than the 1820 land lottery, the deed links Alsaph to a child of Lewis Barker Sr.
During the 1830s Alsaph lived near Isham and Gray Barker. Isham owned Lot 48 in Hall County’s District 11.22 On 4 February 1832 Gray purchased seventy acres in Hall County adjoining Isham’s land on the west.23 In December 1832, when Lumpkin County was created out of Cherokee Territory, Habersham County, and Hall County, Isham’s and Gray’s properties fell into the new county.24 In 1836 A. B. Barker paid taxes as a resident of Georgia Militia District (GMD) 838 in Lumpkin County.25 In 1840 Isham was enumerated there.26 That year Alsaph was enumerated in GMD 831, bordering GMD 838 to the south.27 Both districts lay on the east of Lumpkin County. See figure 1. On 3 January 1848 Alsaph sold the tract to Moses Smith of Union County.35 A month later Moses Smith quitclaimed “one half acres [sic] of land lying in the County of Jackson . . . being the grave yard on the plantation that said Barker sold to said Smith where the said Smith now lives Known by a spanish oak, standing in the center of said half Acre of Land where the graveyard now is.”36 When he sold the property Alsaph apparently forgot to exempt the cemetery from transfer. The deed, demonstrating the cemetery’s significance to Alsaph, connects him to the Jackson County Barkers. Only one candidate remains for A. B. Barker’s father: Isham Barker. While Jesse and Ephraim were probably related to Lewis Barker Sr., the links are tenuous. Jesse likely died in Gwinnett County, where a devastating courthouse fire destroyed early county records in 1871, including direct evidence of Jesse’s heirs.51 Ephraim was old enough to be Alsaph’s father, but no evidence supports the relationship. Despite their geographic proximity, neither Jesse nor Ephraim appears on a known record with a member of Lewis Barker Sr.’s family. Lewis’s ties to Alsaph eliminate Jesse and Ephraim as paternal candidates. Further evidence strengthens that conclusion. Besides Alsaph’s associations with Barkers of his father’s generation, Alsaph was the eldest member of a cluster of Barkers born from 1800 to 1813 living at Wahoo Creek’s headwaters in the 1820s and 1830s. Four—Miriam, Hubbard, Rufus, and Obadiah Barker—have links to Isham Barker. Of surviving antebellum Lumpkin County tax digests, the 1836 record is the most revealing. Taxed in GMD 838 along with Solomon and John Barnes, Alsaph registered for his own taxes and those of Obadiah Barker.62 Obadiah was born in Jackson County in 1814, where Lewis Sr.’s family lived.63 In 1836 Obadiah was serving in the Georgia militia in Florida.64 Family members often registered as agent for kin on tax digests, a role Alsaph appears to play here. The manuscript clarifies certain historical facts. Say wrote “that part of Habersham where Grand Father [Solomon] Barnes lived was cut off to Lumpkin county [in] the year 1839.”79 The year he cites is the removal of the remaining Cherokee from North Georgia, not the 1832 law creating Lumpkin County.80 Saye also states that after “Uncle John” [Barnes] married Miriam Barker, he “settled near grandpa [Solomon], moved but once … only a little up the creek[,] but his first settlement remained a part of his farm for life.”81 This reinforces the census records showing John Barnes enumerated next to his father, Solomon, in 1830 and 1840. When speaking of the marriage of Aunt Miriam [Barker] and Uncle John [Barnes] in the 1820s, Saye writes “they had been living, that is the Barker family, near grandfather [Solomon] Barnes for several years and was well acquainted with each other.”82 Later he says “Aunt [Ruth] married Captain Obadiah Barker[,] the Barker family lived in the neighborhood of my grandfather [Solomon] Barnes.”83 The only Barker family living near Solomon Barnes in the 1820s was Isham’s—see figure 1. They also lived near each other in 1840.84 Say’s aligning three Barker siblings with Isham corroborates public records. Through Obadiah’s support of “Colonel Chastain” for the regimental command (by a vote of the men), Rufus was appointed regimental quartermaster. Details of the account vary slightly, but Say’s outline matches the service records. Alsaph B. Barker has links to four other Barkers slightly younger than himself: Miriam, Hubbard, Rufus, and Obadiah. Evidence suggests they are Isham Barker’s children. Of the five likely siblings, only Rufus Barker’s military service led to a pension. In 1893 his second wife, Sarah Ann Hamby, applied for a window’s pension based on his Indian War service.88 Sarah’s application includes a family record listing the births of ten Barkers, including Alsaph, Miriam, Hubbard, Rufus, and Obadiah.89 See table 1. Without specifying relationships, the family record identifies at least nine siblings of Alsaph. Their listing together, their birth pattern, and the documented associations among five of them make the relationship clear. The list also establishes Alsaph’s middle name as Briggs, a name absent from other known records. Nothing in the pension file, however, implies a relationship to Isham Barker. Isham apparently died in the early 1840s. In 1841 Alsaph bought one thousand acres, which he sold in 1848, obtaining a quitclaim from Moses Smith for a half-acre cemetery.100 The purchase suggests that around the time of Isham’s death Alsaph acquired land containing a family cemetery, where his parents may be buried. Multiple indirect connections show Alsaph Briggs Barker was Isham Barker’s son. Alsaph had ties to children of Lewis Barker Sr. All but Isham can be ruled out as candidates for Alsaph’s father. An 1826 deed connects Alsaph and Isham, who lived near each other. An Indian War widow’s pension file identifies Alsaph’s siblings, four with connections to Isham. No direct evidence of the relationship exists, but the Blue Ridge Barkers’ unified movements and close associations help overcome their genealogical anonymity. Paul K. Graham, CG; Post Office Box 1091; Decatur, GA 30031-1091; pkgraham@gmail.com; http://www.pkgraham.com. Mr. Graham, a recent graduate of Georgia State University’s Master of Heritage Preservation program, specializes in Georgia research and has published two books on the state’s first land lottery. The research this article reports was commissioned by Robert Barker, Virginia Beach, Virginia, who gives permission for its publication. Isham Barker, 12 July 1823, part of Lot 48, District 11, Hall County. See Hall Co., Ga., Deed Book 4:466, Meers to Barker; Superior Court, Gainesville; Georgia Archives (GA) microfilm drawer 77, roll 61 (conventionally cited as “microfilm 77/61”). Solomon Barnes, 4 February 1824, all of Lot 111, District 1, Habersham County. See Habersham Co., Ga., Deed Book D:12, Cox to Barnes; Superior Court, Clarkesville; GA microfilm 179/3. John Barnes, 15 January 1823, all of Lot 46, District 11, Hall County. See Hall Co., Deed Book A:269–71, Hays to Barnes; GA microfilm 77/61. Gray Barker, 4 February 1832, part of Lot 49, District 11, Hall County. See Hall Co., Deed Book C:696, Head to Barker; GA microfilm 77/63. Alsaph B. Barker, 15 April 1836, all of Lot 52, District 1, Habersham County. See Lumpkin Co., Ga., Deed Book D:221, Blake to Barker; Superior Court, Dahlonega.